With every dish he prepares and every menu he designs, Chef Azmin Ghahreman brings together a rich array of flavors and tastes, influenced by his extensive world travels. At Sapphire Catering, we bring this experience directly to you, creating delicious fare and truly memorable events. We design menus and bring to life large-scale weddings and corporate events, serve the Orange County community at charity fundraisers, and set the table for the most intimate of dinners and gatherings. At Sapphire Catering, we work closely to help you bring your vision to life and we view each event as an opportunity to celebrate bringing people together and mark very special moments in our clients’ lives. 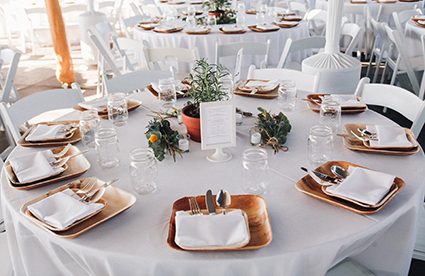 Our success lies in our creativity, attention to detail, and professionalism in putting together stand out dinners, receptions and other events throughout Orange County. Let us help you plan your special occasion! "Rimrock has worked with Sapphire Catering for many years. They have catered our Holiday Parties, as well as many other special events for our firm. Beginning 2 years ago, we hired them to provide lunch/breakfast to our staff 3 days a week. The quality and freshness of the food is excellent and the variety is amazing. The staff is professional, courteous and very timely. Sapphire has been a pleasure to work with on all levels." Sapphire is my go-to catering company for the office. Everyone at Sapphire is always professional and polite. They will do all they can to accommodate my last minute orders. I have some very strict dietary restrictions and they always create something that is enjoyable. I do not even select my own menu, I let them do their magic and I get the most compliments on their food on a consistent basis. Sapphire serves fresh, delicious food and it is apparent that they care about their craft and delivering the whole package of delicious food, amazing service and at your price point.